I think we’ve reached the point at which software developers can stop trying to sell agents on the benefits of mobile applications. More specifically, marketing teams can cease use of terms like “agents on the go” and “always connected.” Isn’t it pretty much assumed that a relatively new product’s success will be predicated on the degree of its mobile functionality? GoConnect markets itself to busy agents on the go. But it doesn’t need to. It just is a real estate transaction management solution. Even lazy agents who don’t go anywhere can use it. Sure, GoConnect is designed for your smartphone, but our smartphones are no longer mobile, they’re omnipresent. In our offices. On our couches. In our bathrooms. Point is, the team behind GoConnect should sell on its merits, not its mobility. GoConnect says it’s a CRM. It also talks about being a checklist app. It very well may be both. I see it as transaction management software. It really doesn’t need a strict definition, though, because it can help real estate agents in a number of ways. Much of GoConnect’s functionality leverages the common taps and swipes and phone rotation commands of whatever smartphone OS you use, making the learning curve quite painless. 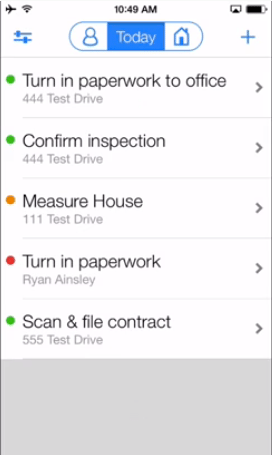 For example, rotate your iPhone to switch from today’s list of tasks to a weekly, more granular view. The power of GoConnect’s four-color categorization really demonstrates its value here, as each item on your calendar can be quickly defined by either yellow, green, red or blue. Tap on what’s more pertinent and get to work. The visuals are color-coded with icons for leads and transactions, and it uses fat, vibrant control buttons that invite interaction. You should know by now that I’m a rather vocal advocate for engaging interface design, and GoConnect has it dialed in. Overall, what GoConnect will does is help you manage the people, tasks and actions related to a transaction. This is why I think it’s more of a productivity tool than a true CRM — but don’t take that as a pejorative. GoConnect employs an interconnected system of checklists that start at the 50,000-foot level of initial lead contact and eventually delves into ground-level task lists, like those that follow a lead’s house going under contract. It logically separates your workflow into New Listings, New Buyer Contract, My Listing Sold and Post Closing. Each colored category, or transaction type, has an included checklist that can be further customized should you want to add unique tasks or employ personal jargon or nomenclature. While the intrinsic task breakdowns are plenty comprehensive given the background of GoConnect’s developers, almost every transaction has its own issues that would demand unique tasks to be created. It is important that software supports the way you handle a home sale. Even though GoConnect is very intuitive, don’t let its ease of use lull you into not committing to it. Take time to customize the workflows and establish a settings protocol that best supports your habits. There are some features within GoConnect that show just how much value software can have when it’s built by actual industry practitioners. When you tap a current transaction, the most critical data is presented cleanly and quickly. Dates. People. Related tasks. A transaction stakeholder can be contacted directly within the app via text, call or email. So can completed and remaining tasks. GoConnect also delivers tasks and milestones to your phone’s home screen, provided you give it permission to in the preferences. 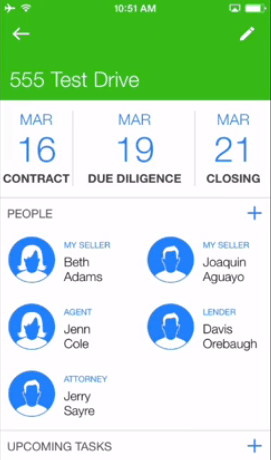 When a new buyer contract or listing is added, GoConnect asks you for a few milestone dates, related contacts, and then automatically creates the requisite checklist and kicks off the transaction. It also has a list for new lead communication. The contacts and lenders, inspectors and various contractors that populate a transaction are all added quickly from your phone’s existing contact list, or can be created within GoConnect. I like that only pertinent data is delivered via GoConnect’s interface, an inherent benefit of mobile applications. User experience designers are forced to be as concise and inclusive as possible when developing for the small screen. Not every app builder accomplishes this. GoConnect’s team did, and it makes for a very uncluttered, productivity-oriented real estate tool. I don’t believe every agent needs an enterprise-level CRM to be good at their job. Industry pressure created by unfounded assumptions about best practices force many agents into unnecessary and expensive software partnerships. Use and interest of these instances tend to die on the vine, like gym memberships and being gluten-free. GoConnect makes it simple to be better at your job. The product isn’t overcooked with features or bulky third-party collaborations. It’s its own solution, and wholly unique. Don’t kid yourself: You’re on your phone all the time. It’s not mobile business anymore. Do you use GoConnect? What do you think? Leave a comment and let us know! Real Estate CRMs: Pros and cons and which is best?